Last week I received a new cookbook in the mail, and what this really means is that moments later I pour myself a glass of wine and sit down reading it cover to cover. I'm a bit of a cookbook hoarder, collecting as many as my bookshelf can store. Diving myself into new recipes, finding inspiration in the photographers, but mostly being absorbed into the story. Reading the how's and the why's. And discovering the possibilities of a little time and patience in the kitchen. When Gjelina arrived last week I instantly knew that this book was going to be one of those books that doesn't get stored in the shelf, but simply lives on my kitchen counter or for this week, on my bed stand. It is the perfect mix of intriguing combinations to simply highlighting the ingredients at their best. 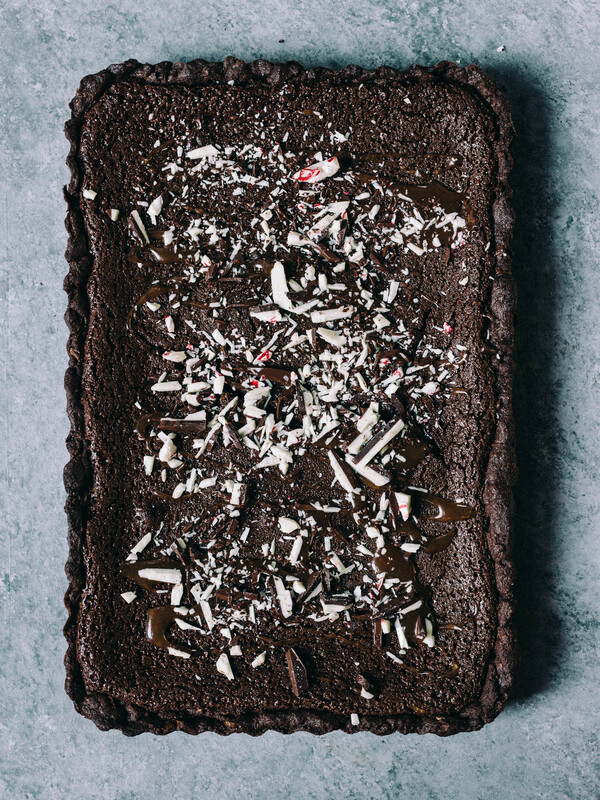 This chocolate tart was adapted from one of the recipes in the book where I simply added finely chopped peppermint bark to the crust, added a little more bark to the topping and a good swirl of salted caramel. This dessert is dark and rich, where a big glass of milk is a necessity. In a large bowl, mix together the flour, cocoa powder, corn meal, finely chopped peppermint bark and sea salt. Set aside. Using a mixer fitted with a paddle attachment, beat the butter and sugar until fluffy, about 2-3 minutes. Reduce the speed and add the flour mixture until just combined. Lay out a long sheet of parchment paper and transfer the dough on top. Place another sheet of parchment paper over top. First, pressing with your hands to push down the dough. And then using a rolling pin, roll out the dough into the shape of your tart pan, giving an extra 1/2” around. Place this on top of a baking sheet and chill in the refrigerator for 2 hours. Preheat the oven to 350 degrees. Butter your tart pan. Take the dough out of the refrigerator, transfer it on top of the tart pan and begin pressing the dough into the bottom and the sides. It is ok if it cracks a little, just take the extra dough from the sides and press over the cracks. Bake for 12-15 minutes until firm. Remove the crust from the oven and let cool on a wire rack. Lower the temperature to 325 degrees. Heat a large saucepan with 1” of water. Place a large heatproof bowl over top and add the butter and chocolate to the bowl. Stir occasionally until smooth. Whisk in the cocoa powder, brown sugar and salt, keep whisking until smooth. Begin adding in the eggs one at a time. Pour the filling into the baked tart crust. Place in the oven and bake for 35 minutes until set. The filling will puff up, just give it a little shake before removing it from the oven to make sure the center is finished. Place on a wire rack to cool for up to 45 minutes. Remove the tart from the pan, top with caramel, more chopped peppermint bark, and a little flaky sea salt. *Notes, I used a rectangle tart pan, this can also be done in a 10” round tart pan or a springform pan.